Quick – think of the last time you were sitting around with nothing to do, trying to kill time? You are probably still thinking. Let me help you – chances are good that it was at an airport. Airport down time can mean a precious few hours of sanity in the midst of a hectic week of traveling – or it can mean total boredom and impatience. Obviously it depends on your travel circumstances and of course which airport you’re at. And whether or not you’re satisfied by shopping for polyester ties. Because let’s be honest – for so long, airport shopping catered to the needs of male travelers. Tie Rack? Brookstone? Golf stores? No thanks. FINALLY, now that it’s 2014, we are seeing airports ditch their fascination with Tie Rack stores and actually include other options for airport leisure. Like Zara. And MAC. Aaaaaand…..airport spas! 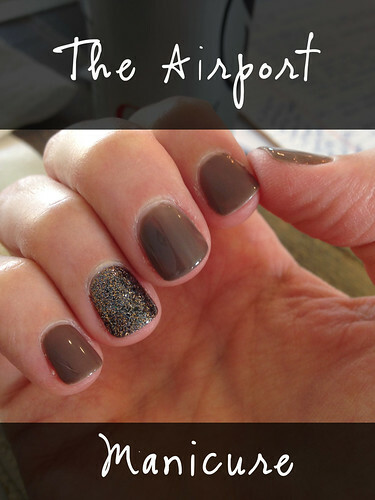 Enter the airport manicure, a beautiful marriage of the practical and the totally girlie. Practical in the sense that you probably didn’t have time to have your nails done before your trip. But now that you’re held captive in the airport? You’ve got nothin’ BUT time. And totally girlie in the sense that who doesn’t want their nails to look good when they’re on the road? Ok….probably a lot of people. But I am not one of them! The two largest chains are 10 minute manicure and XPress Spa (the links will take you to a list of their locations). 10 minute manicure actually offers appointments which I guess I find surprising? But hey, whatever works.Many places have shorter services for people on the go and they are a great way to de-stress when your flight is canceled or delayed. Or if you’re heading to visit that certain relative. The place I can’t wait to try is the butter London spa which has a location in the Seattle airport. But oddly not London? Hmmm. Anyway I recently tried their polishes (a friend gave me this for my birthday) and I love them – so I would love to try them out for a manicure. Normally when I get my nails done I like to bring my own polish so that I can fix any chips that might happen. Even on the road I still like being able to do this so I actually just keep a mini nail polish in my liquids bag. Here are a few options for mini polishes. Read more about minis here and here for how I actually manage to have room for stuff like this in a one quart bag. Still no space? Thank goodness for airport kiosk shopping, where you can get nail polish straight from a vending machine. If you didn’t pack your own polish and are stranded at an airport that doesn’t have a manicure joint – keep in mind that Essie is launching airport vending machines so you can pick up polish on the go – YES!! The machines will be stocked with 42 permanent shades and 6 seasonal colors. Beats a bag of peanut M&Ms. Had a mani at an airport lately? Bought nail polish from a vending machine? Reviews, please!